Congratulations to Belfast-based game developer Billygoat Entertainment Ltd on its recent awards success for a number of Northern Ireland Screen funded projects; Supermarket Shriek and Her Majesty’s SPIFFING. Platform video game, Supermarket Shriek, won Best Social Game at the recent Game Connection Europe Development Awards in Paris. These awards have a history of recognizing and promoting independent game projects in any stage of development. For the last 10 years, they have been the place for studios to showcase their creativity and originality and to be recognized by their peers. 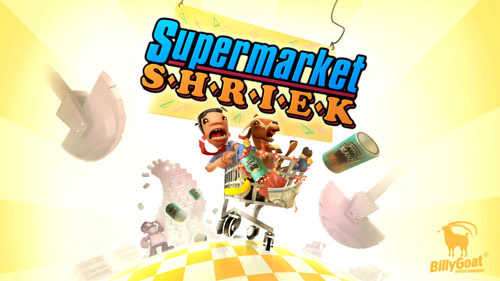 Supermarket Shriek is a unique and amusing co-operative experience in which players assume the role of a man and their screaming goat positioned in a shopping cart. Players ‘shriek’ to manoeuvre their cart around a series of stores, racing to the checkout while collecting groceries, solving riddles and occasionally avoiding large swinging axes, spike traps and/ or fire pits. Billygoat Entertainment also beat tough competition to win the Creativity and Heritage category at the TIGA Games Industry Awards for space odyssey, Her Majesty’s SPIFFING. TIGA is Europe’s largest network of independent games developers and publishers. Its flagship event is the TIGA Awards Ceremony. The TIGA Games Industry Awards, now in their fifth year, are becoming one of the industry’s most exciting and prestigious events. As part of the quirky game, players of Her Majesty’s SPIFFING take charge of Captain Frank Lee English as he (along with his insightful Welsh colleague, Aled) takes to the stars on-board the HMSS Imperialise in this modern interpretation of a classic point-and-click. Players are tasked with solving both mental and physical based puzzles, all the while being rewarded with a sharp and witty script. Both projects received development funding from Northern Ireland Screen with support from Invest NI. Billygoat Entertainment Ltd was founded in 2010, originally focusing on 3D animation before focusing its attention on video game development from 2011 onwards. 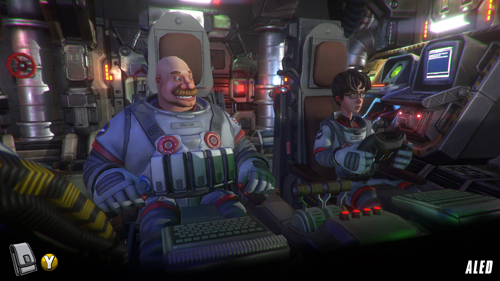 Her Majesty’s SPIFFING is now available to purchase for XBOX One, PS4, Steam, iOS and Android. While Supermarket Shriek is currently unavailable to buy, game-play footage can be viewed here.